Dry and Wet Sieve Analysis is carried out to quantitatively determine the Particle/Grain Size Distribution for soil particles of size 75 micron and bigger. 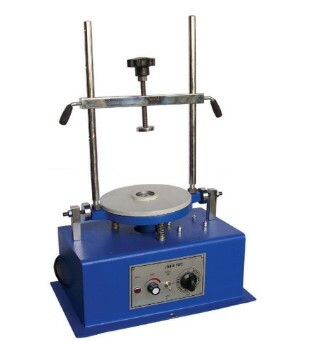 For soil particles of size 4.75mm and bigger, dry sieve analysis is done and for soil particles of size above 75 micron and below 4.75mm, wet sieve analysis is also needed if the soil particles are coated by clay/silt. 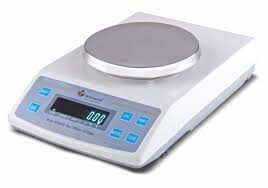 The balance to be used must be sensitive to the extent of 0.1% of total weight of sample taken. 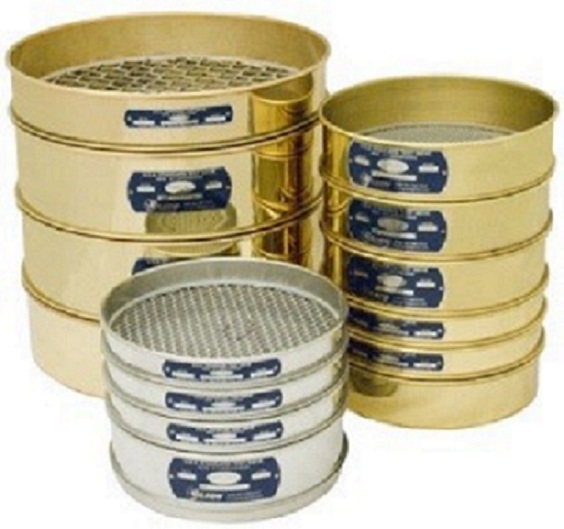 I.S sieves (100 mm, 75 mm, 19 mm, 4.75 mm, 2.00 mm, 0.425 mm and 0.075 mm). I.S 460-1962 to be referred. The sieves set should have lid at top and Pan at base. Thermostatically Controlled Hot Air Oven to maintain Temperature between 105 to 110OC. 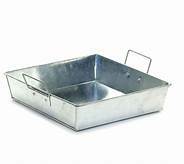 Two or more large metal or plastic water tight trays or a bucket about 30 cm in diameter and 30 cm deep (sizes of the trays are in the range of 45 to 90 cm2 and 8 to 15cm deep). IS-2720 (Part 4):1985 (Reaffirmed- May 2015) “Methods of test for soils: Grain size analysis". The soil fractions retained on and passing 4.75mm Sieve shall be taken separately for the analysis. 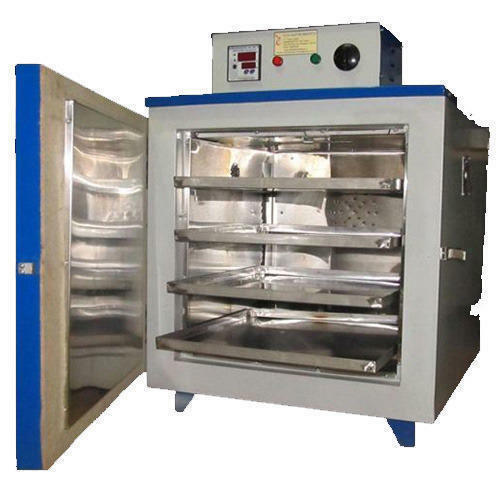 Dry the soil sample in a Thermostatically Controlled Hot Air Oven at 105 to 110 0C. Sieve the sample through the sieve net of size 4.75mm and higher. Other sieves may be introduced in between the sieves, depending upon the additional information desired to be obtained. The sieves shall be agitated and any particles may be tested to see if they will fall through, but they shall not be pushed through. The quantity taken each time for sieving shall be such that the maximum weight retained on each sieve does not exceed the values given in Table 2. Record the mass retained on each sieve. If the sample appears to contain over 5% moisture, the water content shall be determined and the masses corrected accordingly. If the soil contains more than about 20% gravel particles and the fines are very cohesive with considerable amounts adhering to the gravel after separation, the gravel shall be washed on 4.75mm Sieve using sodium hexametaphosphate solution. The portion of soil passing 4.75mm Sieve shall be oven-dried at 105 to 115°C. Weigh this soil mass to accuracy of 0.1% of its total mass and record the mass. Spread out this material in large tray or bucket and cover with water. Wash the soaked soil specimen on 75 micron sieve until the water passing is substantially clean. The fraction retained on the sieve should be tipped in a try, dried in the oven and sieved through the nest of 2mm, 425 micron and 75 micron sieves. The fraction retained on each sieve should be weighed separately and the masses recorded. The percentage of soil retained on each sieve shall be calculated on the basis of total weight of soil sample taken. Then, cumulative percentage of soil retained (which will give % finer when deducted from 100) on successive sieve is found. 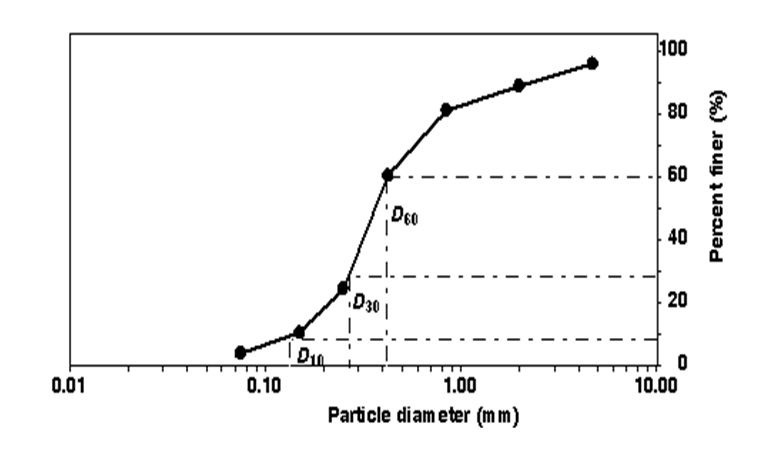 Plot a graph on log scale with "Particle size (Diameter)" on X- axis & "Percent finer" on Y- axis. The graph is known as grading curve (Fig. 7). Corresponding to 10%, 30% and 60% finer, obtain diameters from graph, which are designated as D1O, D30 and D60. 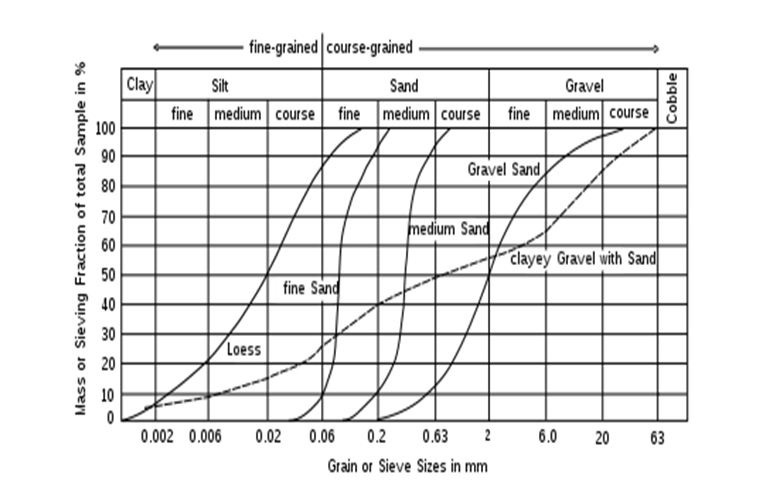 In the case of clayey soils, dry sieving shall not be used and wet sieving shall be used.